The Stop Online Piracy Act and the Protect IP Act aren't dead, with the U.S. Senate headed toward an initial vote on PIPA Tuesday, opponents of the two bills said Thursday. Senate Majority Leader Harry Reid, a Nevada Democrat, has scheduled a cloture vote -- a vote to override a threatened filibuster of PIPA -- for Tuesday, even though about 20 senators have announced opposition this week, including six who had co-sponsored the bill. Senator Patrick Leahy, a Vermont Democrat and Senate Judiciary Committee chairman, introduced PIPA on May 12, and the committee voted to approve the bill and send it to the Senate floor two weeks later. In the House of Representatives, Lamar Smith, a Texas Republican and House Judiciary Committee chairman, introduced SOPA on Oct. 26, and the committee held one hearing on the bill. Of the six witnesses invited to speak, only one opposed the bill. In Wednesday's protests, thousands of websites, including the English version of Wikipedia, Reddit and Mozilla.org, went dark to protest the two bills. Google remained open for business, but blacked out its logo on its homepage and asked users to sign a petition opposing PIPA and SOPA. More than 7 million people signed the petition, Google said Thursday. Participants of two anti-PIPA briefings on Capitol Hill Thursday called the protests a tipping point in momentum, and possibly a signal of changes in the way Washington does business. 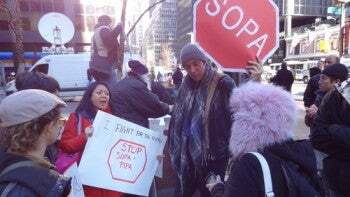 "Four months ago, I would say that the Hollywood community thought this legislation -- PIPA and SOPA -- were cooked, fully baked, and were going to be rammed through the legislative process," said Markham Erickson, executive director of trade group NetCoalition.